5. THINKING ON YOUR FEET IS A MUST. I think this one is a real no-brainer. We all know the weather is constantly changing, but sometimes the changes can be so rapid that you need to be on your A-Game and know how to react properly. One example: rapid refreeze in the winter. If you have wet sidewalks and pavements going into the night, and if clouds clear and temperatures drop suddenly to near or below freezing, there are going to be some widespread issues. This is when thinking on your feet and paying close attention can be a huge asset. 4. YOU HAVE TO BE ABLE TO WORK WITH OTHER PEOPLE. It's difficult to go it alone, especially in this field. Being able to work as a team with other people is an absolute must. I cannot count how many times I've asked for an opinion on something when producing a forecast. And although I may be 99% certain on how the weather will play out, others can provide insights or thoughts on the situation that I may not have necessarily thought of, but will find beneficial. In turn, I must also be ready to provide by opinion to my fellow coworkers as well. It's all a team effort. 3. COMMUNICATION IS LITERALLY PART OF EVERYTHING I DO. This one took a little while to realize, but when people say "communication is key", it's a real understatement in this field. Communication is quite literally my entire job. Whether it's putting content on social media or giving a verbal weather briefing to a client, I communicate ALL THE TIME. And if I'm not good at it, then my message either doesn't get across or it is received in a way that was not intended. And in this business, the way the information you provide is interpreted is what others will make actionable decisions on. 2. HAVING A THICK SKIN IS A REAL BENEFIT. When you work in a consulting business, you're bound to have some criticism. It's just a part of the game. But being able to "weather the storm" (see what I did there?) and absorb some of the punches thrown at you is definitely something that's worthwhile in this field. But, this leads right in to my final point. 1. HUMILITY AND A WILLINGNESS TO ADAPT IS KEY. Absorbing punches and taking criticism is one thing, but keeping an open mind and actively listening when it is offered constructively is VERY important. No one is perfect. But, if you listen to what others are saying, you can take it as an opportunity to reflect and improve for the future. It doesn't matter whether it comes from your superiors, clients, or the public. There is a reason someone chose to reach out and tell me something that they did or did not like. It's up to me to listen to it and apply the necessary fixes going forward. And there you have it. 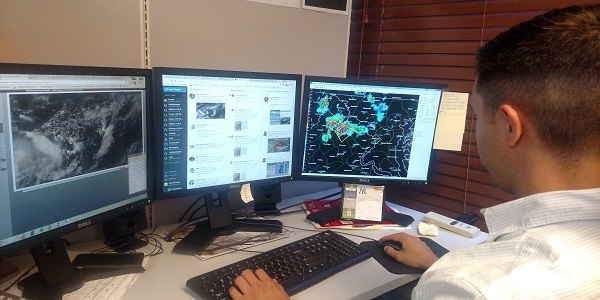 Those are the top five things I have learned since becoming a professional meteorologist. What do you think? Is there something I missed? Let us know on Facebook or Twitter.